The Led Zeppelin reunion show recorded on December 10th, 2007 at the Ahmet Ertegun Tribute Concert in London’s O2 Arena was a huge gift to us Zeppelin fans. They not only performed very well that night but they also brought with them an awesome set list – and even played For Your Life for the very first time in public. Cellphone videos of individual songs and bootlegs of the entire show appeared on the web quite quickly and initially there were rumors circulating that they had no plans to release any kind of official DVD or CD of the event. This of course got me looking even harder for any audio or video clips I could find. Eventually they did release official copies on both DVD & CD in November of 2012 under the name Celebration Day, but until then, all we had to feast on were cellphone videos and the audio recordings taken from them. 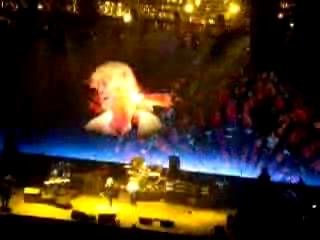 While there are plenty of things to get excited about over the entire reunion show for any Zeppelin fan, one of the things I had initially stumbled on was a very poor-quality cellphone video of them performing Kashmir, and in it, something magical. I can’t listen to this version of the song without thinking of it – and sadly, thinking of it is all I can do even while watching the official DVD release. Because much to my dismay, they somehow managed to leave that special moment out! Well, technically it is there, but they missed an opportunity to show a better angle and closeup. The moment I am talking about is when Robert belts out that awesome scream during the first break at around 2:20 – and specifically, Jimmy’s reaction to it. It was Jimmy’s eargasm face – a grin from ear to ear. I’m sure the song had been rehearsed that way but during their performance that night, that scream was epic and Jimmy couldn’t hide his reaction – which had conveniently been up on the huge screen behind them as it happened. In my opinion, this reaction should have been clearly visible in the official release because it simply makes the whole thing even better. Sadly it isn’t. If you are a huge Zeppelin fan who hasn’t seen this before, I think you’ll understand why I am writing an entire post about it. My apologies for the crappy video but it’s all I have (and I’m thankful to have it). If anyone knows of a better copy, please let me know where to find it. What a great moment to capture of one of the greatest songs by one of the greatest rock bands in history! Bonzo would be proud.